In June, China accepted its first shipment of American beef in 14 years amid advancing trade discussions. An isolated case of mad cow disease in 2003 prompted American beef bans across the globe, shrinking industry exports by 93 percent (see figure). 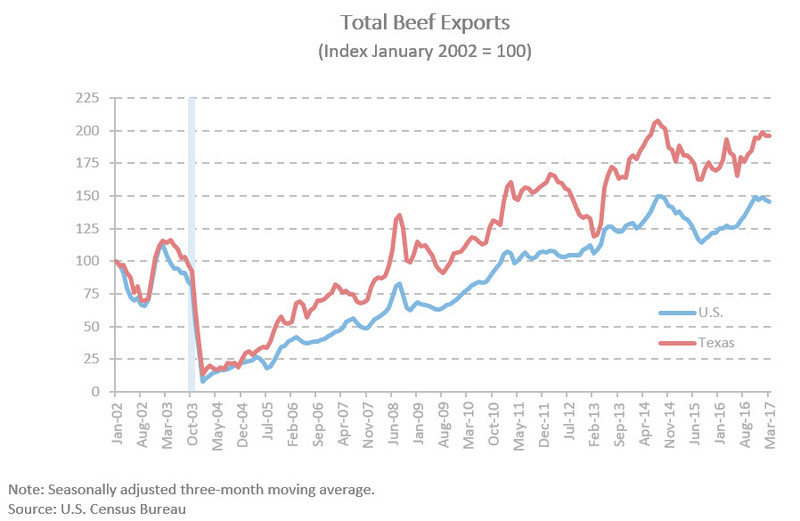 Beef exports did not fully recover until 2010 and have bounced around $360 million since 2013. In 2002 to 2003, China imported just $23 million of American beef, accounting for less than half of a percent of U.S. beef exports. China’s role was even smaller in Texas, accounting for less than one-fifth of a percent of beef exports at $1 million. Unsurprisingly, China’s American beef prohibition was unnoticeable, but bans in Japan and South Korea slashed Texas exports by $249 million in 2004. Japan and South Korea slowly regained confidence in the American product, surpassing pre-crisis import levels from Texas in 2014 at $296 million combined. While other nations followed suit, the Chinese ban held fast despite growing domestic demand. American beef still found its way into the country through Hong Kong, but quantities were limited.